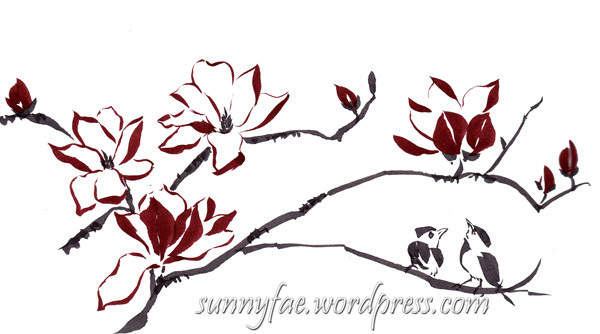 Chinese brush painting style painting of magnolia in ink with a brush pen. 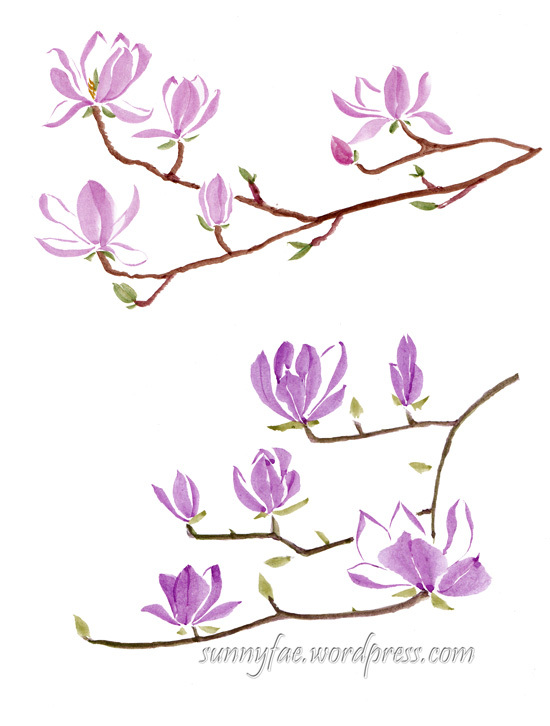 This week I have been experimenting with magnolias. Gardens and parks are filled with their beautiful blooms; I have taken lots of photos and really wanted to capture some small part of it. 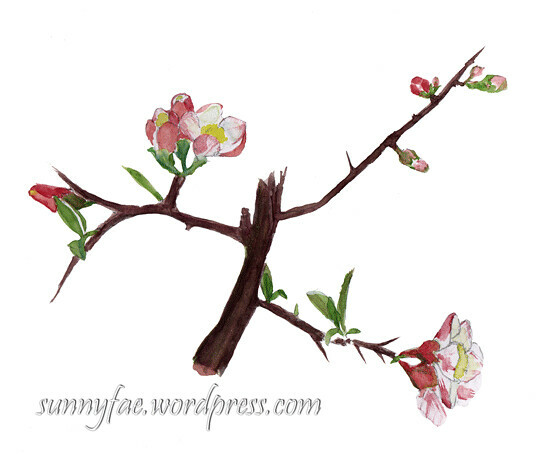 Remembering the Chinese brush painting I tried in October (inktober) I thought it would be fun to paint the flowers in this style and after thumbing through my book and reading some very brief instructions I copied the picture in the book. 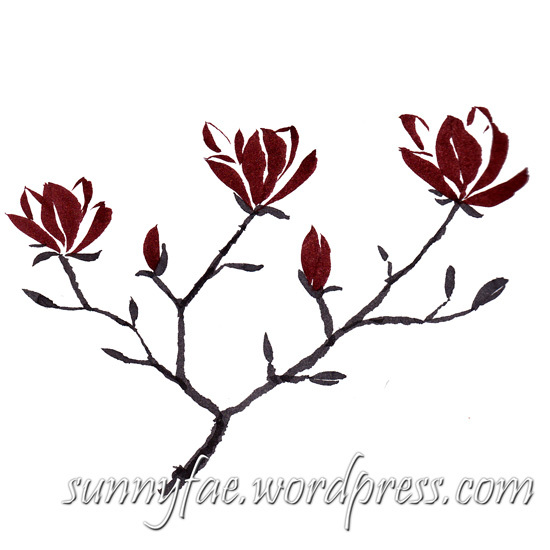 Chinese brush painting style painting of magnolia in ink with a brush pen. This exercise was taken from a book. I didn’t fancy grinding down ink so I used two pentel brush pens, one filled with black ink and the other with red ink (I filled an old cartridge with a pipette). 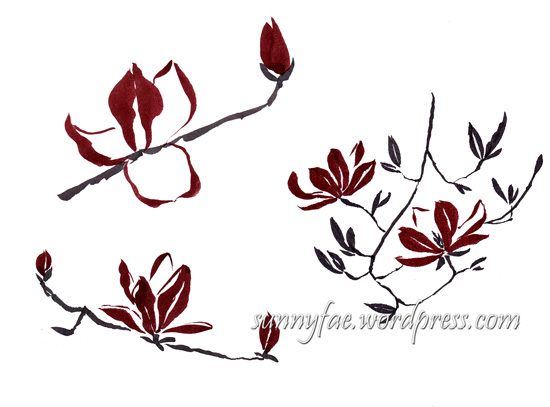 magnolia painted in ink with a brush pen Chinese brush painting style. I painted the magnolia in the style of the flowers in the book and after a few paintings decided to have a go with watercolour. I’m using a sable paint brush not a Chinese brush and making the shapes I wanted took a little practice but I think they look OK.
Having loads of fun now and painted one side of the page in watercolour, the other side with brush pens, just to see how they look side by side. 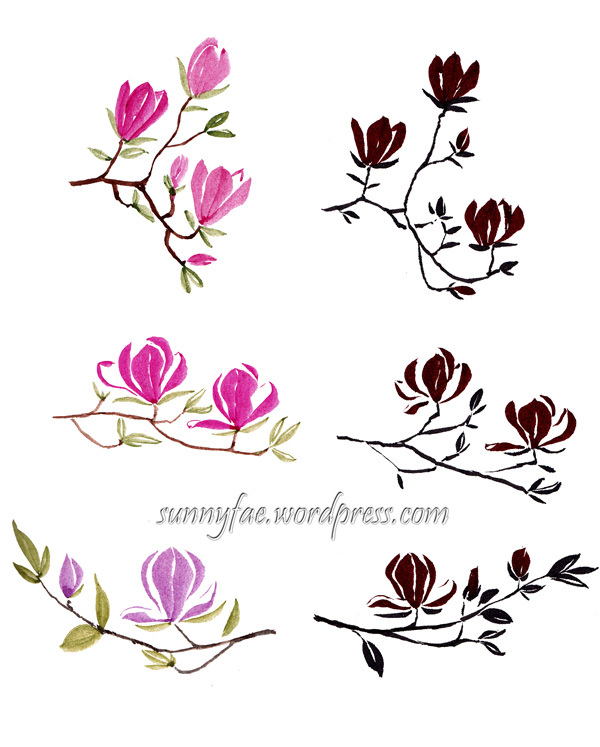 Magnolia brush painting experiments. watercolour on the left and ink on the right. 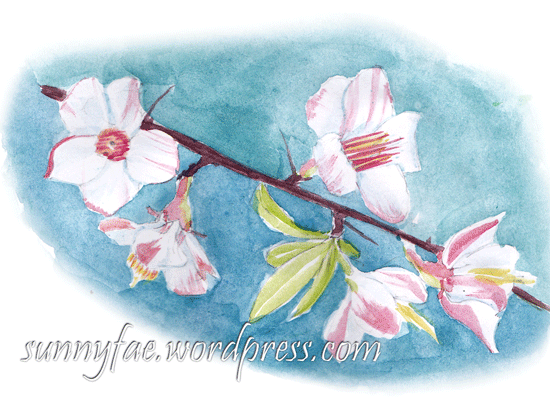 I really like the ink magnolias, they’re quite graphic and I think I painted them a bit more confidently but with a little more practice the watercolour magnolia will look a lot better. 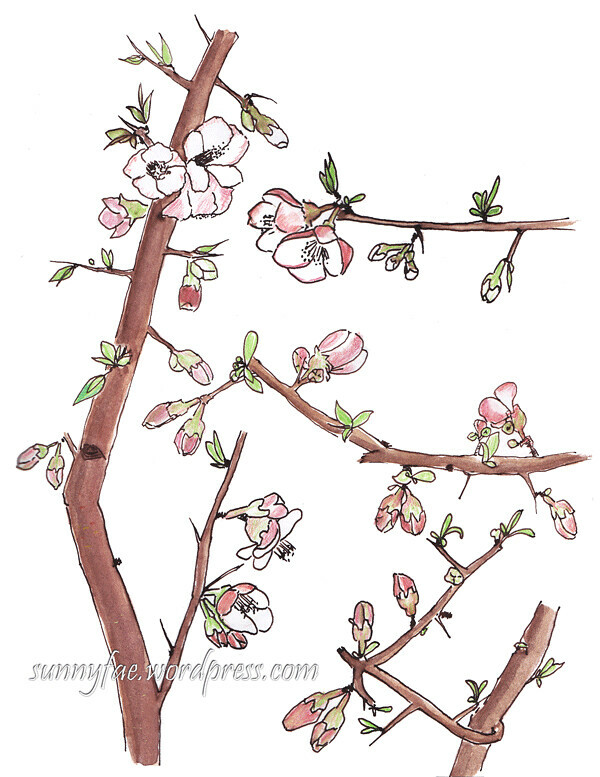 A few weeks ago I drew some japonica quince flowers in the garden; they’re pink and white a little like apple blossom. This week the other japonica in the garden started to flower. These flowers are quite different to the others, they’re orange and where the pink flowers flare out, these are more cup-shaped. They are beautiful in the spring especially as the sun hits them and really brighten up the garden. 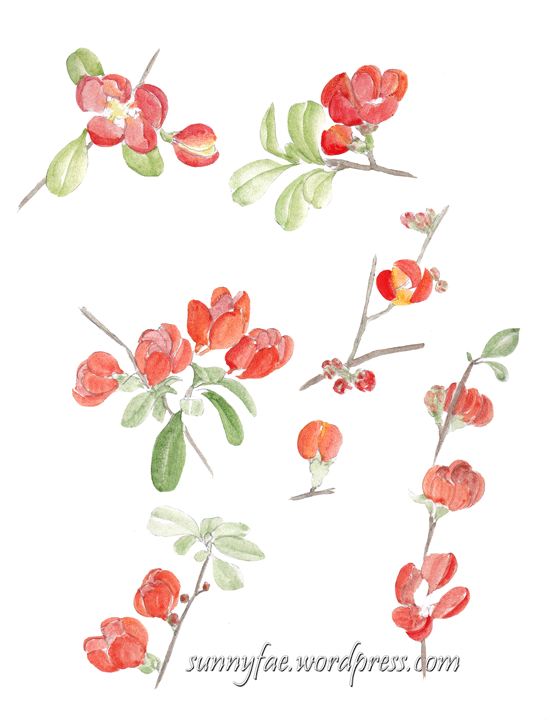 We’ve had a lovely sunny week so sitting in the garden drawing the quinces is a very relaxing thing to do. At the zoo the quinces are also out, theirs differ again with their flowers being bright red. I noticed a small piece had broken off so picked it up and carried it home. As I drew it I turned it around in my hand to show different positions. I do love the bright yellow stamens against the deep red flowers. 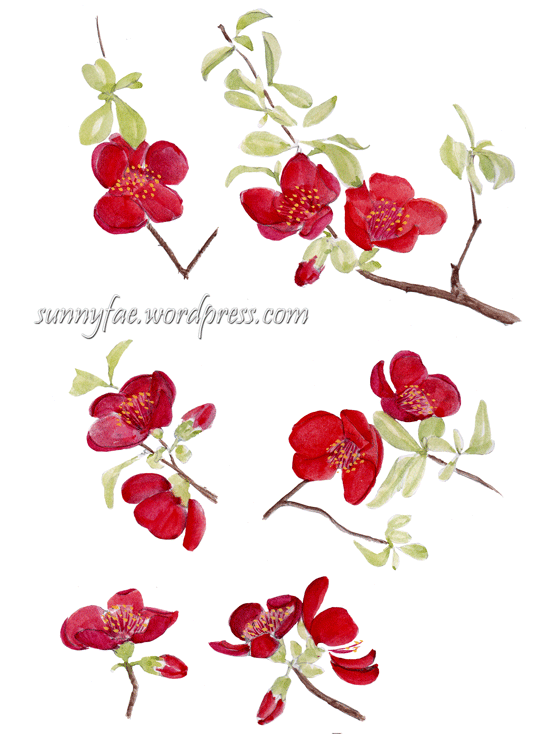 The first quince is still flowering although the flowers are starting to fall now so I stood outside for a while with my sketch book and a fountain pen filled with red ink and drew a few branches. Then took a water brush and pulled out some of the ink to shade it slightly. This small watercolour sketch was painted in my sketch book, cartridge paper is not really meant for lots of watery washes but it was enough to give the idea of what the flowers look like, if I think ahead next time maybe I’ll take a piece of watercolour paper out with me. I really have the most delightful time drawing in the garden this week, and since the clocks went forward this week I’ll be able to stay out there even longer. Good times! 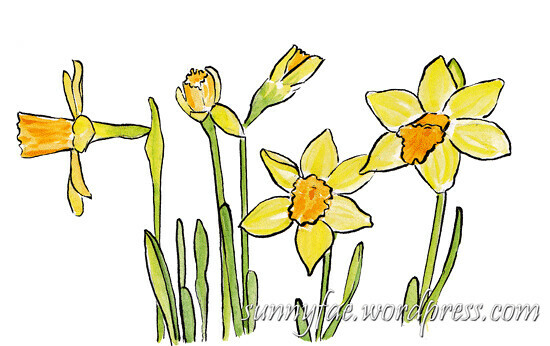 Everywhere I look at the moment there seems are daffodils, in gardens, at the roadside, parks, shops, every where, but not in my garden. I have a few pots full of daffodil leaves but they have no flowers? 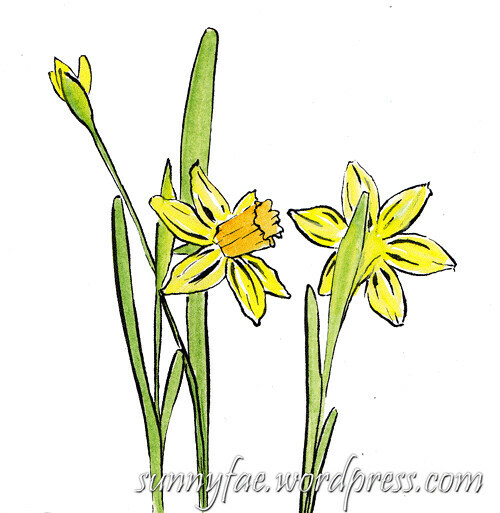 Whilst out shopping last week I saw a small pot of midget daffodils for only £1 so I bought one and brought it home. I thought they would make good drawing models and they did, they sat still and looked beautiful what more could I want. 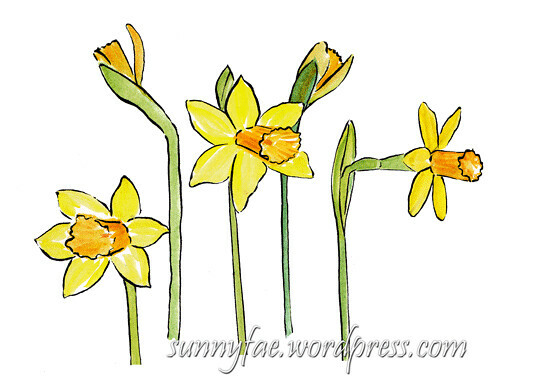 Turns out daffodils are harder than they look. I’ve draw lots of them, turning the pot each time to give a different view. It doesn’t matter how many times I draw them it’s always the same. Maybe it’s the yellow I’m using it seems quite opaque (a bad workman blames his tools!) I find it hard to work out shadows with yellows, there’s a slight green tinge to them in places, then red in others, purple is the opposite of yellow and should make a good shadow, I seem to make it into a muddy mess though. Spring is springing and I’ve been watching the Japonica’s outside in the garden, waiting for them to flower. The flowers on this plant are similar to apple blossom, white with a pink bush on the outside of the petals. I have another plant on the other side of the garden that is much smaller in size with orange flowers but they’re not ready yet. They’re called Japonica (oriental ) quince not to be confused with the other pear shaped fuzzy quince. I have one of those too but it’s too early for it to be in flower yet. Out I went, sketch book in hand to draw the lovely flowers. 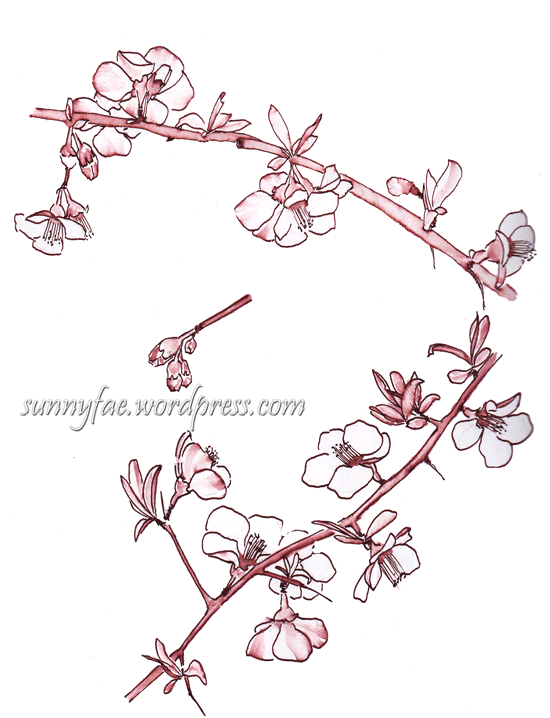 Here the flowers are just budding; it was a very quick sketch in watercolour (no pencil )to get the idea of the shapes. 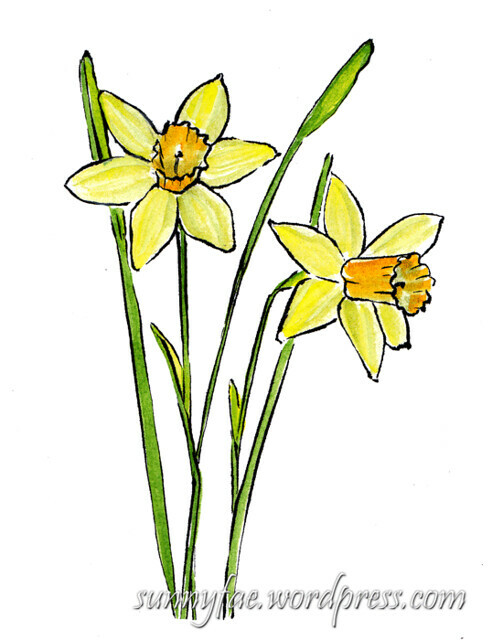 Over the week as the flowers have started to open and I nip outside to draw one or two sprigs; it’s been quite cold so I draw what I can in as short a time as possible before my fingers get too cold. I tried a bit of ultramarine for the shadows in these quince flowers and I quite like the effect. I tend to draw bits of the plant rather than the whole thing, it’s all trunk/stalk with small branches that hold the flowers and buds close to the trunk. This was drawn with a fountain pen and gives the best idea of the structure, imagine it at about six or so feet tall (it really wants to be taller but then I wouldn’t be able to pick the fruit in the autumn). 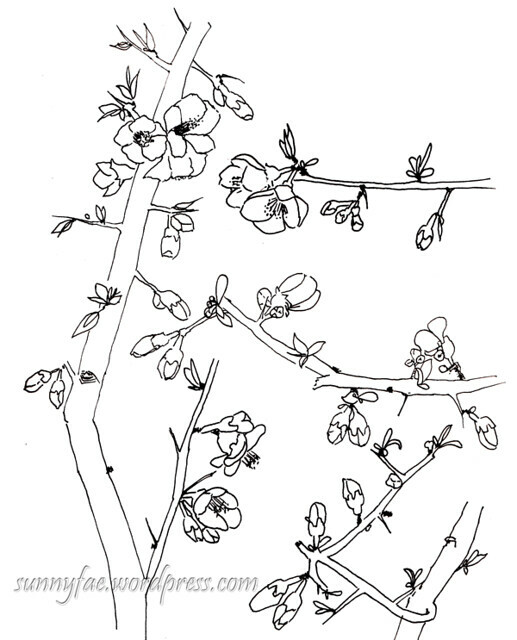 Japonica quince flowers drawn with a fountain pen. Did I mention the sharp spiky thorns, ooof! After scanning the line work in I thought it looked a little sad so I coloured it in, because I had used water-soluble ink to draw it so decided to use watercolour pencils for the flowers and leaves so it didn’t turn into a huge brown inky mess. Ahh that’s better. 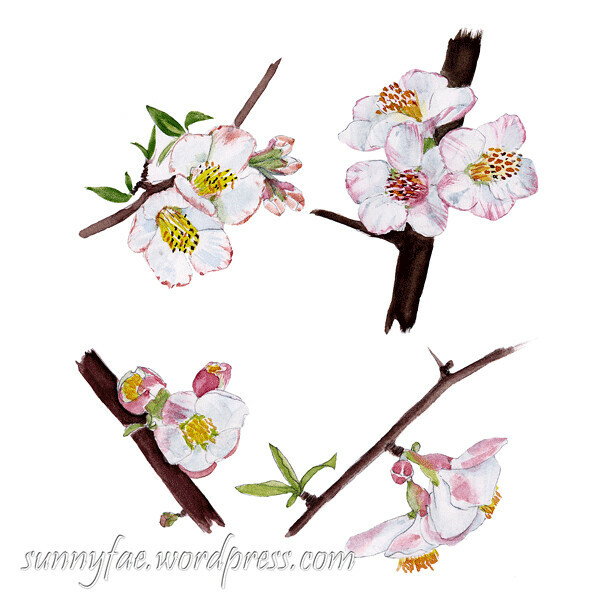 Quince flowers outlined in fountain pen with watercolour and watercolour pencils. If I get time I might draw a few more over the week as it’s in full bloom now and it would be a shame to miss such a lovely drawing opportunity. 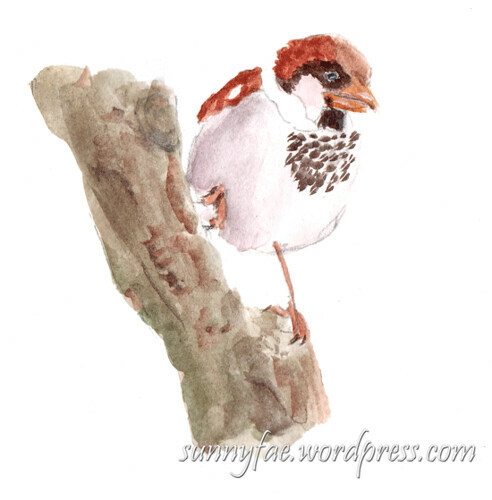 Red winged sparrow watercolour sketch. We visited to the zoo last week; the weather was a bit changeable so we ducked into one of the aviaries. There is a small shelter/gazebo thing in there, it kept most of the weather off and we get to spend time looking at the birds. Amongst the birds were some Red winged starlings nesting amongst the beams in the roof. They spent a lot of time above us but occasionally came down to check us out so I took a lot of photos. They are very dark in colour, almost black with red flashes along the wings. I would have liked to get a few photos of them flying but that will have to wait for another day. I had taken photos of them in a few different positions so thought it would be fun to draw as many as I could. 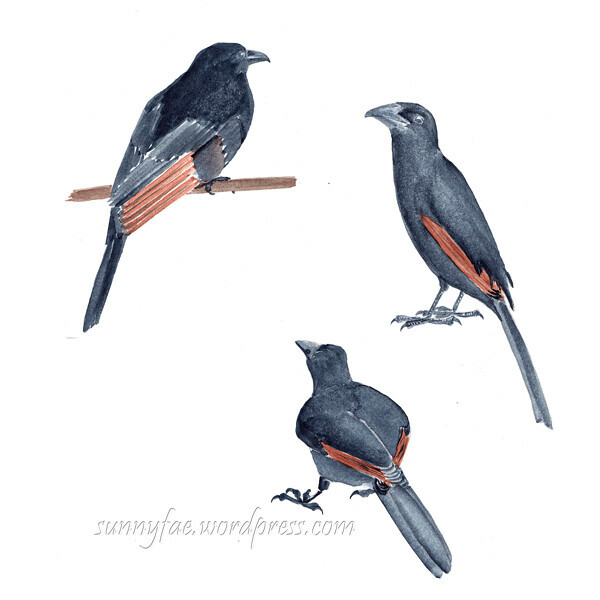 Watercolour sketch of Red winged sparrows. These were painted and outlined with a brush pen. This is the way I usually finish my drawings. 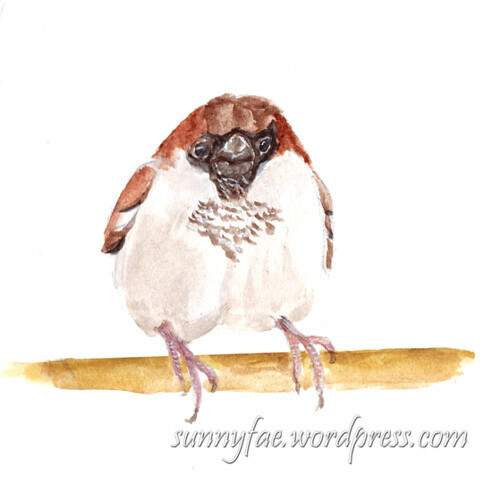 More watercolour sketch of Red winged sparrows. This page was painted but I didn’t outline them with a pen this time, done to compare the difference in styles, just experimenting really. 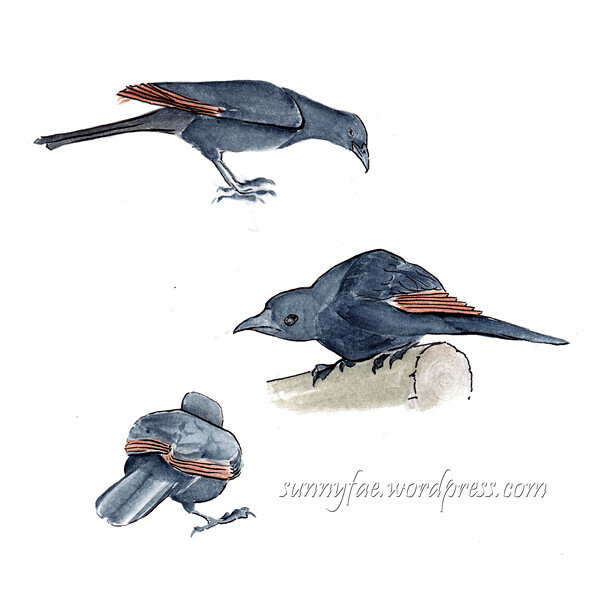 I wanted to see if I could draw one of the starlings using only pencil, working out the tones. I’m reasonably happy with the result, it looks bird like and I managed to work out most of the tones. 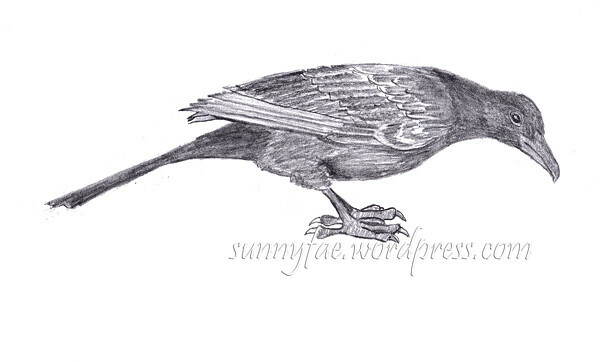 Graphite drawing of a Red winged sparrow. It was even colder and windier this week so we visited the houses and took more photos, hopefully for future drawings. 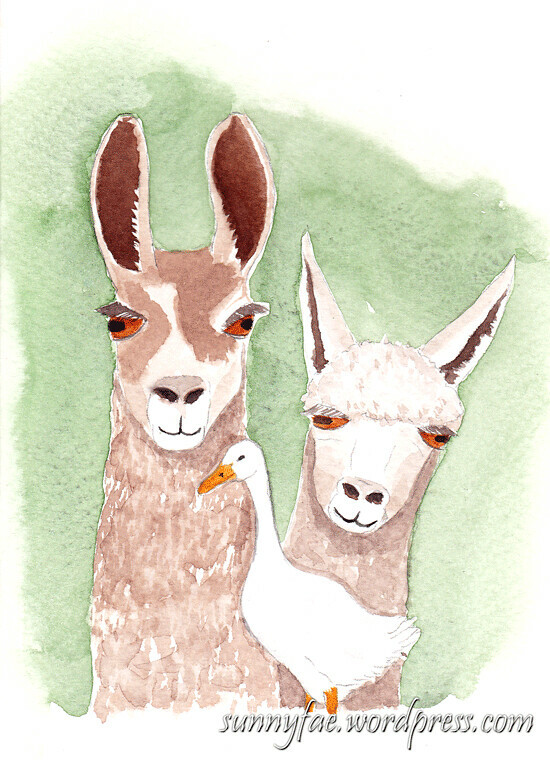 Llama llama duck, a watercolour birthday card. It was number one sons Birthday this week so I painted him a card. Llama llama duck based on a silly YouTube video we saw ages ago. It’s hard to think of things for guys cards so I just go with any idea I can think of, even silly ones. The bird at the front is a supposed to be a duck not a goose (art fails *sad face*) I think the neck got longer each time I drew it but it’s really a duck, honest. It’s watercolour on student grade 300 gsm watercolour paper; I usually paint on the right hand side of the paper then fold the paper down the middle to make a card. It made him smile so my work is done hehehe. I’ve been decorating so not much arting going on this week. On Tuesday the weather was so beautiful, we didn’t want to stay indoors so we drove over to Ness Gardens (the local botanical gardens) they have a lovely snowdrop walk (sadly fading now) and the daffodils and spring flowers all coming into their own. 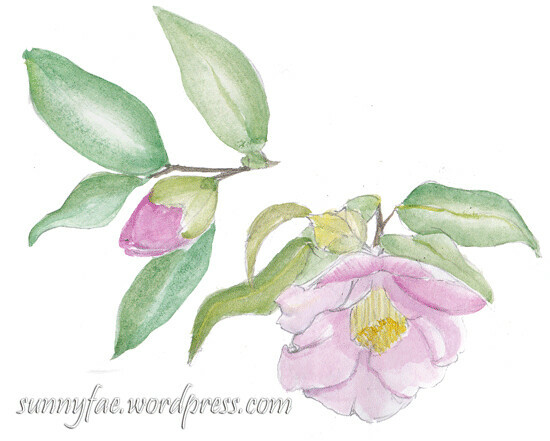 The camellias are blooming so we stopped for a few minutes to draw a few blooms. A lovely way to spend an afternoon. 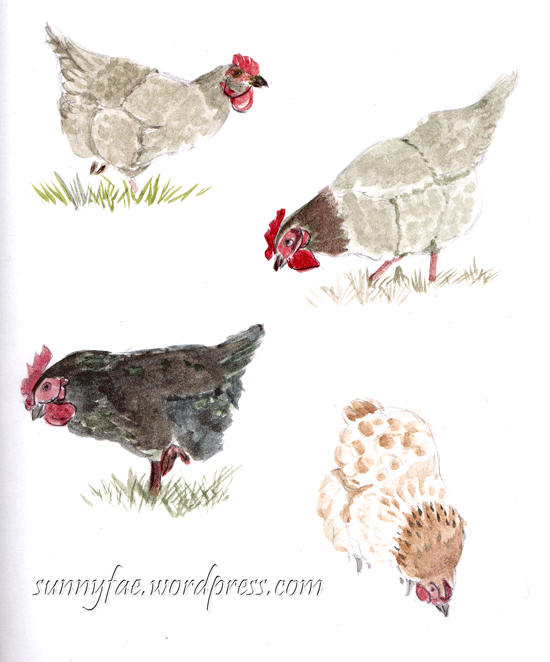 I don’t have any lovely pictures this week; I have mostly been learning to draw chickens. I was scooting around the interwebs and found an odd page from a book by Glenn Vilppu. This guy is a drawing master so I followed the exercise on the page. He starts with loose shapes; a circle etc and turns them into amazing drawings. My drawings are not quite so amazing but I have to start somewhere and then just practice a lot, then a lot more, right? First I copied the exercises from the page. I love how he managed to get so much expression into a few shapes. 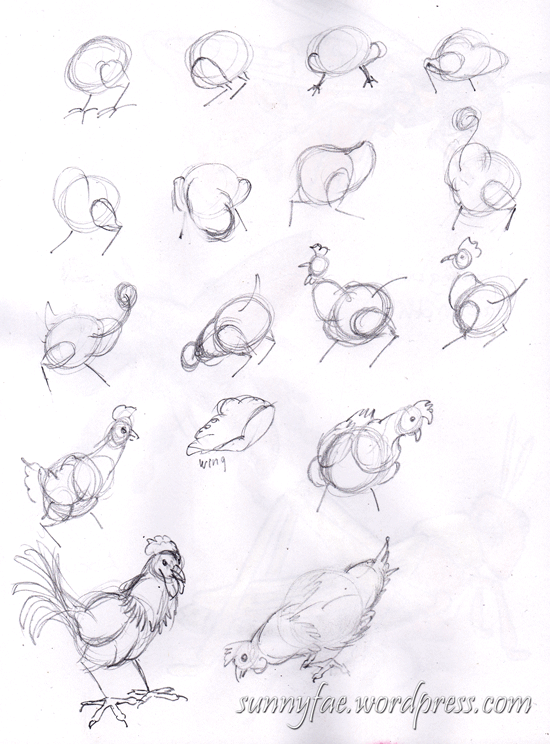 Chicken drawing exercises, this is pretty much the page I found. 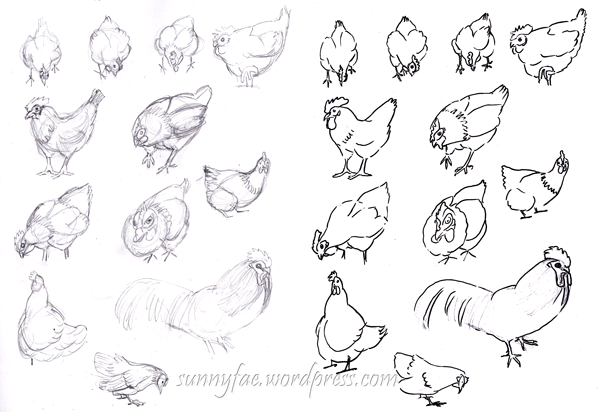 Next I started drawing from all the photos I’d taken of chickens; they are a bit rough and drawn with a pencil. I would like to eventually be able to draw in the shading and tones but don’t have those skills yet (more practice needed). I scanned the pencilled page into the computer but it doesn’t show up too well so I drew over it with a Pitt brush pen and scanned it again so you can see the shapes. 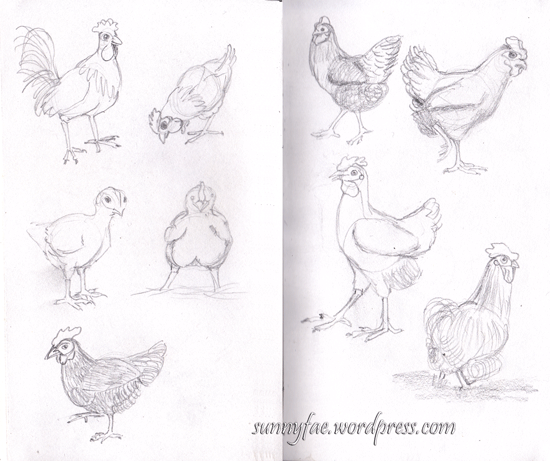 First chicken pencil sketches. Drawn in pencil and inked over for a better view. The image at the top of the post looks a bit chicken-ier and so far is the only one with any colour, again drawn from my photos. I am trying hard not to draw over the top with my brush pen. I have drawn chickens before both from life and photos but with all the feathers and fluff it’s hard to know which part I’m drawing. Finally after having seen this one page from Vilppu’s book I’m starting to understand what I’m drawing. 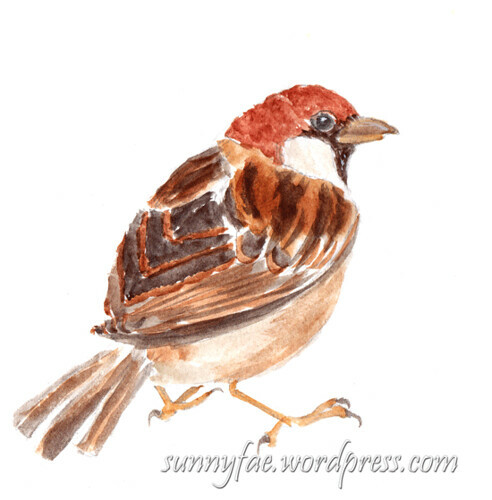 I’ve drawn and painted lots of sparrows over the past few months, usually when Chinese brush painting and I wanted to see if I could draw some more realistic birds, it’s good to know the actual shape so as to understand how best to stylise them later. 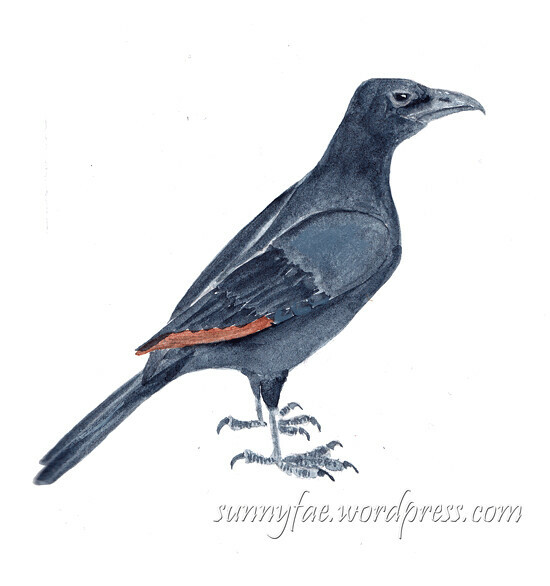 I think the birds I drew were all male; the females are a little duller in colour like this one below. I try to take photos of the birds but I have to take them inside through the window because the sound of the camera shutter is quite loud and frightens them off. 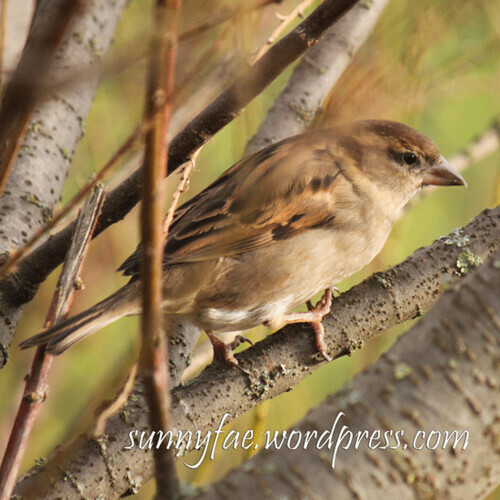 I’m hoping that as the weather warms up there will be more birds around and I will get a better look at them.